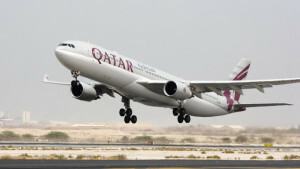 Aircrafts registered in Qatar and the national carrier, Qatar Airways, can now fly through the United Arab Emirates (UAE) and Bahrain’s air spaces, the Montreal-based International Civil Aviation Organization said Tuesday. The Montreal-based International Civil Aviation Organization (ICAO) has been working with “various Middle Eastern states to ensure equitable access to airspace for Qatar-registered aircraft” since sanctions were announced on June 5, ICAO spokesman Anthony Philbin said. UAE, Bahrain, Saudi Arabia and Egypt on June 5 severed ties with Qatar over its alleged support for terrorism. The four countries cut air, ground and sea links, banning Qatari aircrafts from their air space. “Some existing air route availability has been assured, and some new temporary or contingency routes have also been developed,” including through Bahrain and UAE airspace, he told AFP news agency. In face of the ban, which has affected the national carrier’s business and travellers’ plans, Doha urged the ICAO to intervene. “The ICAO and the states involved are continuously monitoring related air route suitability and ATM (air traffic management) measures, which may still be subject to further modification if necessary, by mutual agreement,” Philbin said. A meeting held in Montreal last week discussed contingency routes that had been planned as part of a preliminary agreement reached earlier this month, but not yet opened to Qatar-registered flights, Al Jazeera reports. Posted by KanelkaTagba on Aug 9 2017. Filed under Gulf News, Headlines. You can follow any responses to this entry through the RSS 2.0. Both comments and pings are currently closed.